23.8% Increase in internal flow area compared to standard intercooler. 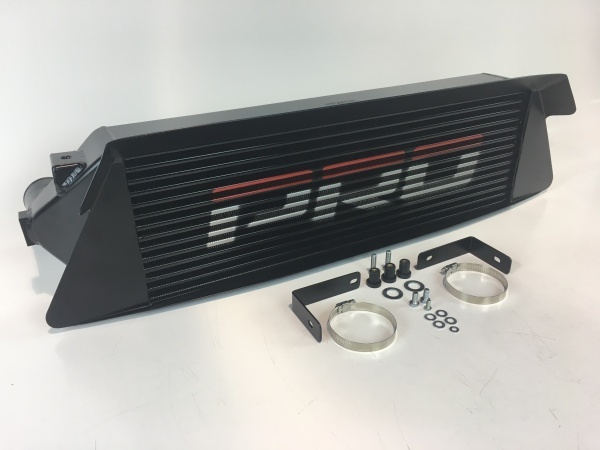 The new Pro Alloy Focus RS Mk3 all aluminium Intercooler features a large air scoop surrounding the core face to grab all the incoming air from the RS's front bumper, ramming it through the light weight tube and fin core. The end tanks are designed for maximum flow and strength, and are shaped to guide the air through the core with as little resistance as possible. Each end tank is individually hand crafted by our team of craftsmen, with precision TIG welding on the inside and outside of the tanks, helping to improve charge air flow through the internal surfaces, as well as making them ultra strong - a massive improvement over the weak, OE crimped on, plastic part. The Pumaspeed Workshop team are ready to fit the Pro Alloy MK3 RS Intercooler in our Head Office located here. We estimate the labour time to be approximately 1.21 hour(s) costing £94.38 inc VAT. Therefore making parts and labour a total cost £685.18 (inc. VAT). Pumaspeed have a specialist distribution team that can dispatch the Pro Alloy MK3 RS Intercooler to any destination worldwide.